Transition to the big tub safely with this inflatable duck bathtub that has White Hot® technology to let you know when the water is too hot. Rub-a-dub-dub, meet your ideal transition tub! When baby has outgrown the infant tub, the next step can be a tricky one to figure out. 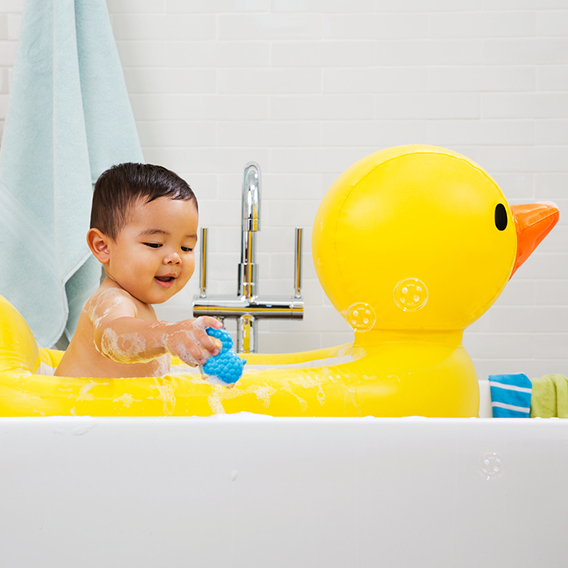 Munchkin's White Hot Inflatable Safety Duck Tub makes that big tub transition smooth sailing for both you and your little one. Peace of mind is truly top of mind with this innovative baby bath. Built-in White Hot® technology tells you when the water is too hot for baby's sensitive skin. The textured non-slip surface keeps baby secure, and the convenient inflatable design is padded, creating a safe and comfy environment for baby to splash around in. You don't need to fill the whole tub with water (just a few inches will do), and there's a drain so you can empty the bath easily without any heavy lifting. And because this duck-shaped bathtub deflates and folds compact, it's perfect for use as a travel tub, too.